We’re down on the farm for this one with Spud O’Reilly, a suitably generic Irishman for an overall unimpressive game. Its theme is odd, and it offers nothing at all new for players. There are the usual kinds of bonus rounds (free spins and “pick a box”), and the artwork isn’t necessarily bad. There’s very little to really love and there’s not a lot to really hate either. It just all feels very standard. 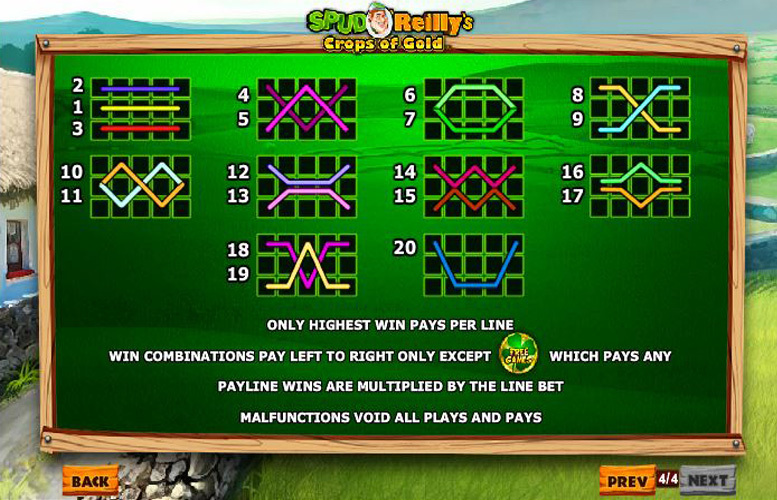 The gameboard is a five reel, three row grid, and there are a maximum of twenty win lines that be active at once. With a maximum bet of £2,000 per spin, it’s an ideal title for those who really like to splash their cash. Huge top prize. 10,000x the line bet is a substantial amount. Couple of decent-yielding yet uninspired bonus rounds. They’re the same as so many others but they pay well. Who is Spud O’Reilly and why should I care about him? He just appears to be some stereotype of an Irish farmer. It’s a very weak theme. No innovation whatsoever. The game is a clone of so many others out there with different graphics and artwork. Many of these other games have enjoyable characters, not just some stereotype of an Irish farmer. Spud O’Reilly (wild) = 10,000x the line bet. Irish undies = 500x the line bet. Tractor = 400x the line bet. (Presumably) Spud’s wife = 100x the line bet. 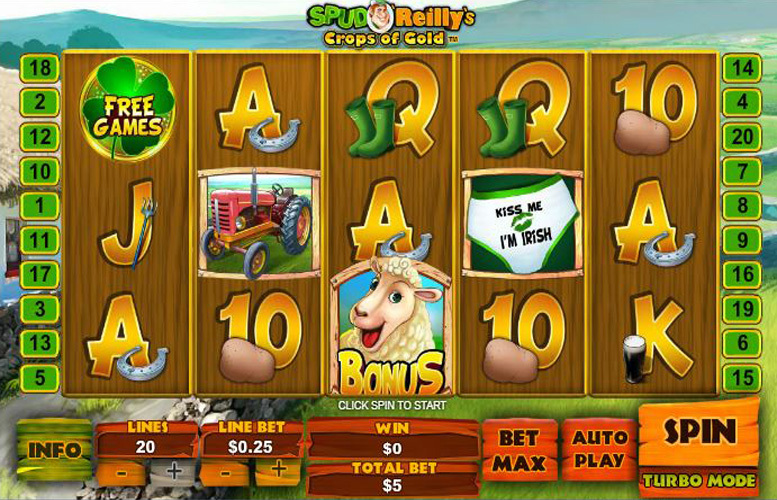 Spud O’Reilly’s Crops of Gold has standard game features. There’s little innovation going on but it’s not like free spins with multipliers, and instant cash prizes aren’t great fun. Landing three or more consecutive sheep “bonus” symbols on an active pay line starting on the leftmost reel will trigger the sheep shearing bonus. First players must choose a sheep to shear. The number of the “bonus” symbols triggering the round will influence how many sheep players can give a haircut to. Three, four, and five symbols allows three, four, and five shears respectively. Behind each sheep’s woollen coat is a cash prize. 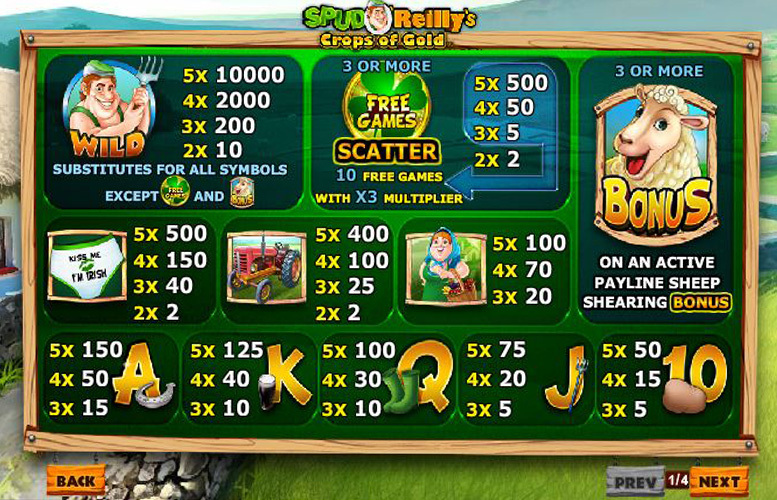 Landing three or more clover “scatter” symbols anywhere on the gameboard will trigger ten free games. These are also subject to a generous 3x multiplier. 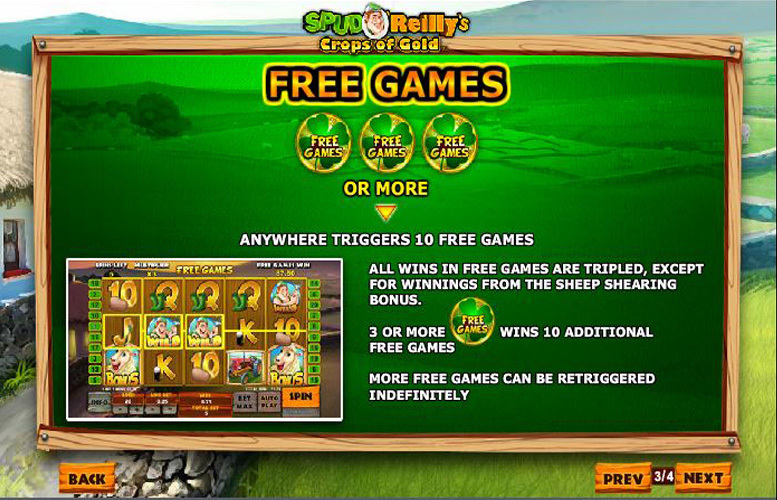 Unfortunately, if players trigger the sheep shearing bonus during free spins, these winnings are not tripled. What’s more, hitting three or more clover “scatter” symbols will trigger another ten spins – a dynamic that can occur infinitely. 10 = 50x the line bet. Players can vary both the number of win lines they place their wagers across, and the amount bet on each. The minimum and maximum win lines are one and twenty respectively. Meanwhile, the lowest line bet is 1p, and the highest is £100. This makes the maximum bet per spin possible on Spud O’Reillys Crops of Gold an incredible £2,000. Conversely, by setting both values to their minimum, the lowest bet on each spin possible is just a penny. All told, Spud O’Reillys Crops of Gold is a rather lack-lustre offering from a company that usually provides players with much more. I really don’t understand why I should give two hoots about some Irish farmer. I’ve nothing against him but he’s not a vampire, or a dinosaur, or ninja. You see, most slots focus on excitement of a form – football, or fighting monsters, or something. The farmer theme here just feels lazy. This would all be forgiven if the game brought some new dynamic to the table but it doesn’t. It’s standard in every sense. It’s not that it’s a bad game it’s just nothing at all stands out. If you’re a keen farmer, or have a passion for all things Irish, you might get a kick out of it but there are much better titles out there. All that said, it does have a huge return to player rating, and that is something that can negate some of the harsher criticisms. This game has a rating of 3 / 5 with 359 total reviews by the users.